Anyone who attends the London VMUG will have been impressed by our very own chairman Alaric, who has been running the event for over 5 years – in his own typically humble words he’s “the tall bloke who bumbles around waving his hands at the start and end of the day” but without Alaric we wouldn’t have the VMUG we have today. As an attendee you don’t always appreciate the hard work that goes into planning and arranging our quarterly meetings and especially the UK national event, it takes a lot of personal time and dedication, something Alaric has given freely over the years, and he has been appropriately awarded by the VMUG board of directors for his service to the VMUG. 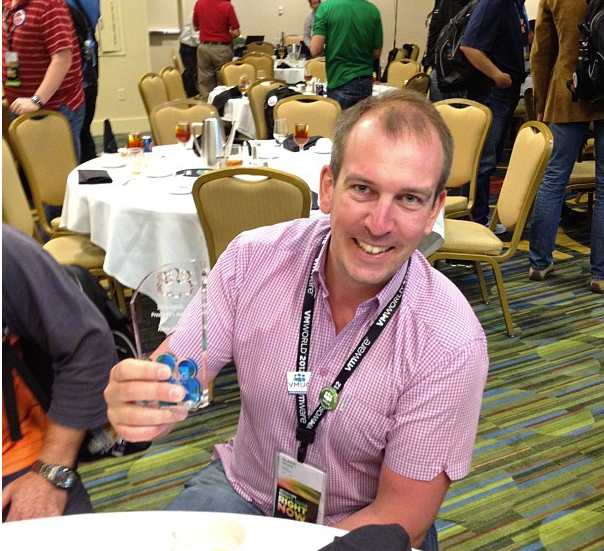 Please join me in congratulating Alaric (and all the other VMUG leader award winners).